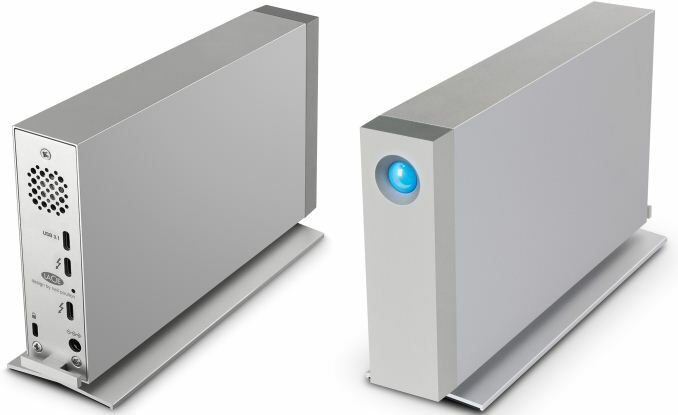 LaCie at CES introduced its new storage devices with Thunderbolt 3 interface. The new LaCie Rugged Thunderbolt USB-C and the LaCie d2 Thunderbolt 3 support 2.5” and 3.5” storage devices, use Intel’s DSL6540 Thunderbolt 3 chips and can expand storage capacities of contemporary PCs up to 10 TB. The LaCie Rugged Thunderbolt USB-C drives can be connected to almost any modern computer with a USB 3.0 Type-A, USB 3.0 Type-C and Thunderbolt 3 ports using a USB or a TB cable. Furthermore, the drives feature previous-generation Thunderbolt connectors to maintain compatibility and offer high performance with systems like Apple’s Mac Pro. The LaCie Rugged Thunderbolt USB-C will be available in two versions: the thinner one will support SSDs and HDDs up to 1 TB and 2 TB respectively, another is for 2.5"/15 mm HDDs and will use Seagate BarraCuda HDDs with 4 or 5 TB capacity. When it comes to performance, the SSD-based Rugged Thunderbolt USB-C will offer a maximum read speed of up to 510 MB/s, whereas HDD-based drives will offer up to 130 MB/s transfer rates. 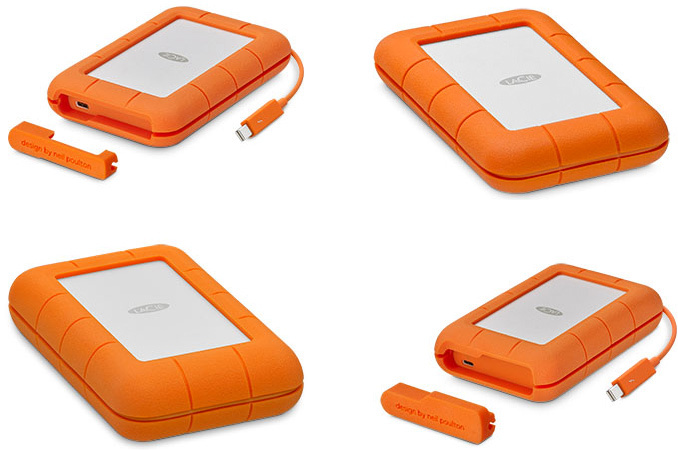 Traditionally, the LaCie Rugged drives come in IP54-rated white and orange enclosure that protects against shocks, dust and water. In addition, the drives support AES-256 software encryption. The new LaCie Rugged Thunderbolt USB-C drives will be available this quarter starting at $249.99. The LaCie d2 are a bit less flexible storage devices compared to their rugged brethren when it comes to compatibility (they do not feature older Thunderbolt connectors), but they offer higher capacities and higher performance compared to HDD-based versions of the Rugged Thunderbolt USB-C. 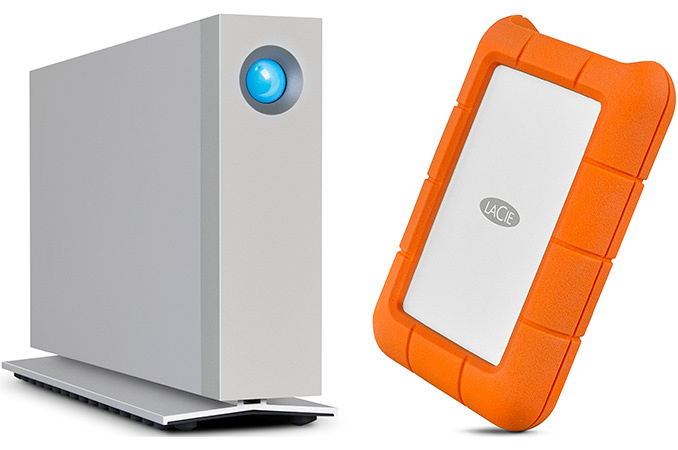 The LaCie d2 drives pack Seagate’s BarraCuda 3.5” HDDs with 6, 8 and 10 TB capacities (so, the top-of-the-range model is helium-filled), come with a Thunderbolt 3 interface only and are compatible with systems featuring TB3, USB 3.1/3.0 Type-C and USB 3.0 Type-A ports (with an appropriate adapter). The LaCie d2 feature two TB3 headers and can be daisy-chained with other TB3-supporting devices. When it comes to performance, the high-end model offers up to 240 MB/s data rate, the more affordable devices will be a little slower. Since the d2 drives use premium BarraCuda HDDs, they are backed by a five-year warranty. As for the pricing, it starts at $429.99 for a 6 TB model.